Dallas Mayor Mike Rawlings promised late Tuesday to review demands from the widow of a fallen firefighter. Jenny Wilson called a press conference Tuesday afternoon, insisting on an independent investigation into her husband's death and changes in fire department policy. Stanley Wilson, 51, a husband and father, died when a burning building collapsed on him while fighting a six-alarm fire at the Hearthwood Condominiums on Abrams Road in May 2013. 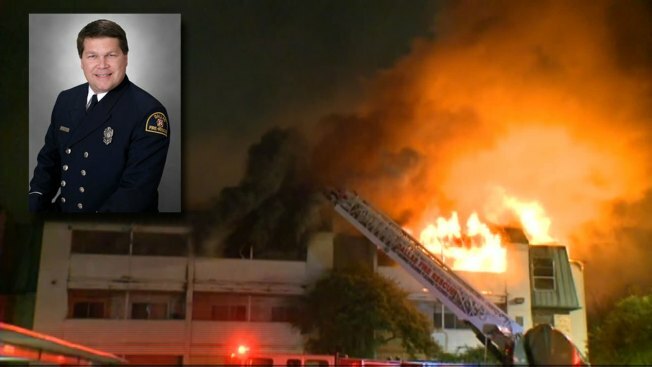 UpdatedMayor: Fallen Firefighter Was "A Hero"
He was ordered back into the building after it had already been searched, but no one was ever disciplined for mistakes made at the scene. Jenny Wilson’s lawyer, Barry Hasten, said a 703-page report on the May 2013 fire was edited into 111 pages released by Fire Chief Louie Bright in September 2014. "Both reports were withheld for 15 months under the guise that there was an ongoing arson investigation, which we now know was blatantly false," he said. Hasten said the final version omitted strong language about the lack of department discipline and a culture that protects jobs instead of lives. "We had hoped we could bring a lawsuit, if nothing else, to expose the people who allow this culture of indifference to exist unchecked and to bring about much-needed change,” Hasten said. But the lawyer said Texas law forbids the family of a civil service employee from suing the city, so they’re asking Rawlings and other city leaders to see that changes are made. Wilson's family wore red T-shirts at the press conference that read, "Stand Up for Stan." "All I wanted was a sincere apology from the fire department saying, 'We're sorry.' That didn't happen," said Jenny Wilson. Dallas Fire-Rescue Lt. Joel Lavender said an independent State Fire Marshal investigation has already been conducted and changes are being made as the result of Stanley Wilson’s death. “Stanley Wilson’s death was a terrible tragedy for our city. I want to make sure Dallas Fire-Rescue learns whatever it can from what happened on that day nearly two years ago through the information contained in three different reports that have thus far been issued regarding this fatal fire. Therefore, I am asking the City Manager’s office to provide me an update on the status of any changes that are being made as a result of the investigations. I am also asking for more information regarding the possibility of recording ground radio communications in the future and what it would take to make that happen. To see the documents from our smartphone app, click here.